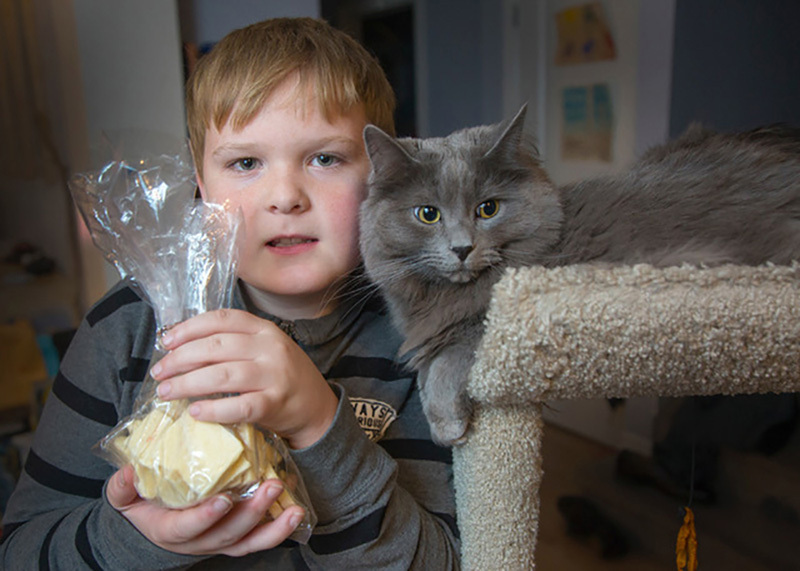 A ten-year-old Chestermere resident baked over 500 shortbread cookies in support of the Alberta Animal Rescue Crew Society (AARCS). “I’m selling cookies, so I can raise money to give to AARCS,” said Nikolas De Neve. “I really like animals and I want to give them money, so they can help animals that don’t have homes,” he said. Nikolas’s mother Colleen De Neve was at work when she received a phone call requesting that she stop and pick up ingredients. “I wasn’t sure where the idea came from, but I know that he loves animals. I’m not surprised that he came up with this,” Colleen said. The De Neve’s made over 500 shortbread cookies from a recipe that has been in their family for generations. “It’s an old recipe, it’s a simple recipe, but it’s a good recipe,” Colleen said. Nikolas originally had a goal of raising $200 for AARCS, but quickly surpassed the amount, with the support from the community. “It’s good, because a lot of people wanted to help the cats,” Nikolas said. “The whole community’s support was amazing,” Colleen said. 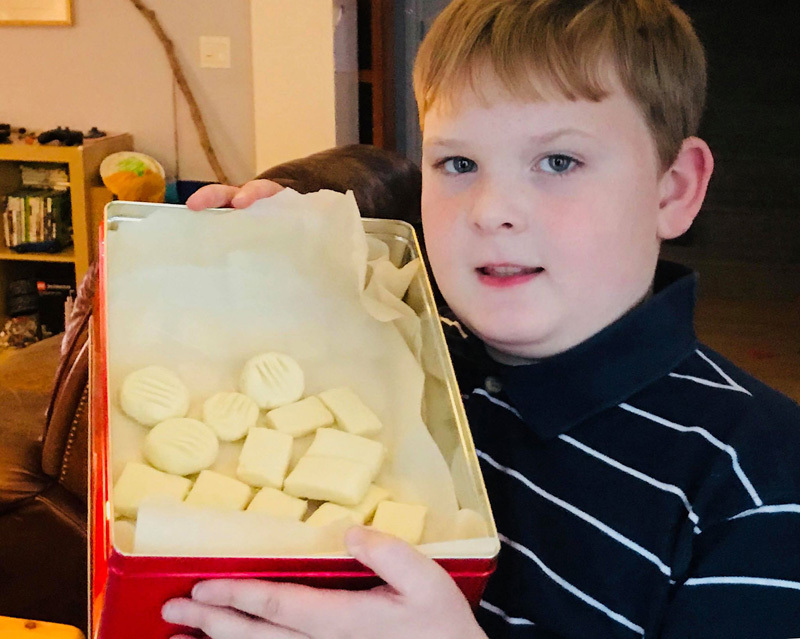 Nikolas said he made the first batch of shortbread cookies himself, however, the entire family stepped up and helped him cut, bake, and package the cookies. “He’s the one who spearheaded it, it was completely his idea,” Colleen said. However, the De Neve’s did run into challenges while baking the shortbread cookies. A common challenge they faced was ensuring the butter to make the cookies was soft. “There were a couple times that we would make a dozen and then realize we need more butter, but we would have to wait,” Colleen said. In an attempt to make sure the cookies were cut more efficiently, Colleen purchased a cookie press. However, it took longer, and made the cookies uneven. “We were ready to throw it across the room because it was causing us more headaches then it was worth,” Colleen said. Although there were challenges to making over 500 cookies, supporting her son was the most important thing for Colleen. “I think anything that we can do to support our kids being better global citizens is really important. “It’s important to support them whenever we can, if he comes up with an idea, I’m going to make sure that he is able to do it,” Colleen said. Nikolas is always ready to help and does volunteer cuddling cats on the weekends at the Cat’s Meow, Colleen said. She added, “He loves animals, and he wants to do things for them, so I wouldn’t be surprised if there are more fundraisers on the horizons. You are such a kind soul..Nikolas..I really admire You..I support them too..even have bought food and delivered it to them..when they were in the NE..Now I donate money to help them..I have even visited them too..